Dyed yarn on bobbins is put onto a warping rack (Picture 1) and fed thru pulleys and guides so that it ends up in the correct order on the warping beams (Picture 2) to make a specific fabric pattern. 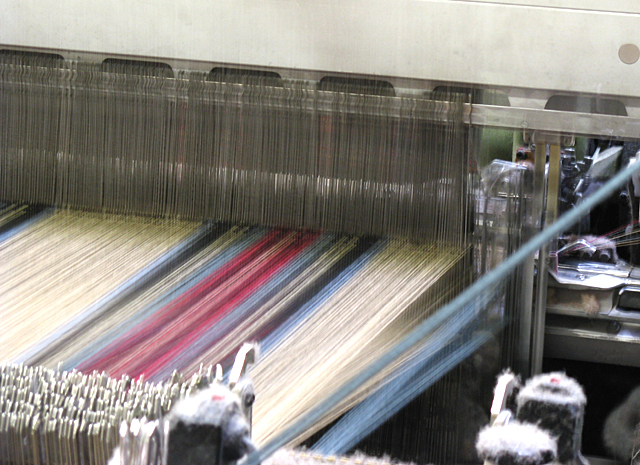 The beams are loaded onto the loom (Picture 3) and threaded through individual wire heddles which go up and down at the appropriate time to make a shed (the open triangular area between warp threads in Picture 4). A shuttle (or perhaps some other mechanism in these high-speed looms) moves the weft thread through the shed, then the heddles are moved to open a new shed for another weft thread (perhaps the same color, perhaps a different color) to be passed thru. 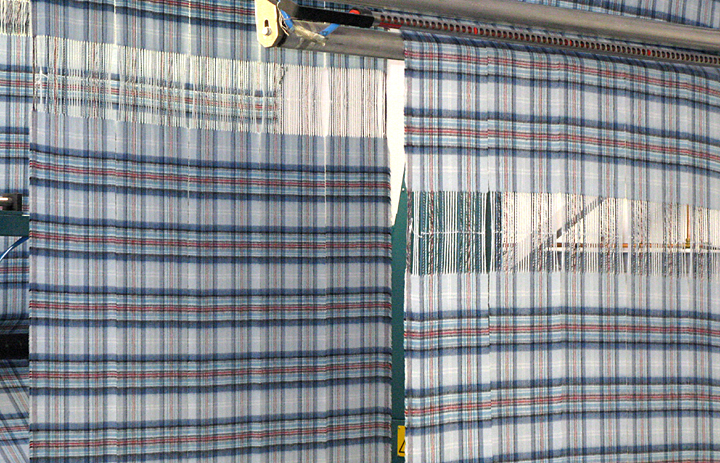 The end result is the woven fabric, as shown in Picture 5. 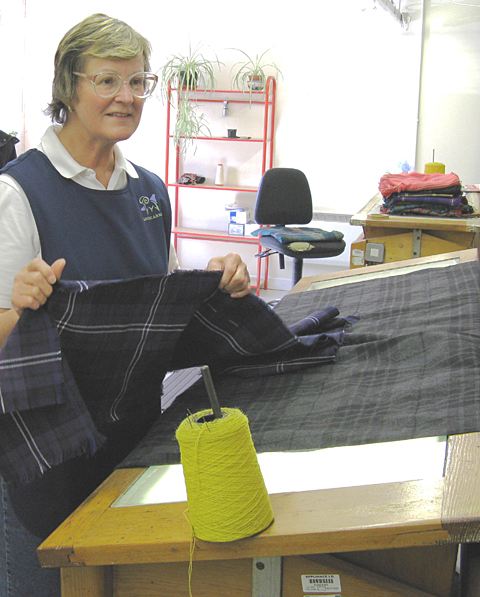 Different mills are licensed by different families and clans to make specific tartans. 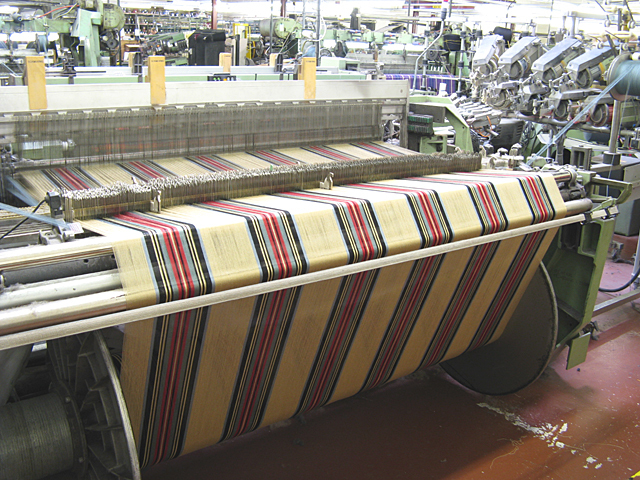 The Locharron Mill is the only mill authorized to make the Princess Diana tartan. 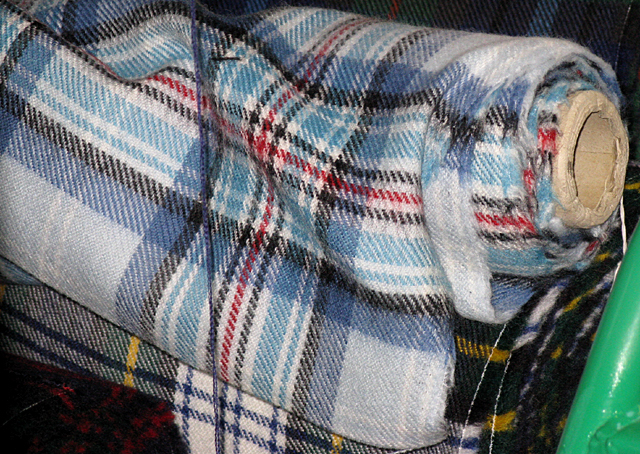 A bolt of this red, white, blue and black tartan is shown in Picture 6 and racks of Princess Diana scarves (still strung together) are shown in Picture 7. I expect these are a big seller in their gift shop. Take a look at these fabrics (Picture 8). Aren’t they beautiful? Despite the apparent simplicity of the plaid design rich combinations of colors are obtained from just a few basic colors where warp and weft intersect, sometimes the same color, sometimes not. But, I say “apparent simplicity” because if you study the details of a tartan (Picture 9) you can see that the weave is more than just a simple over-under weave. 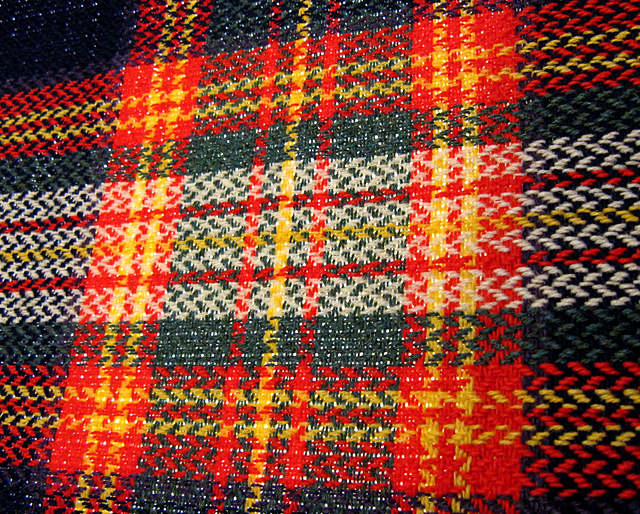 I spent some time talking with the clerks in the gift shop and found out some interesting things about tartan colors. 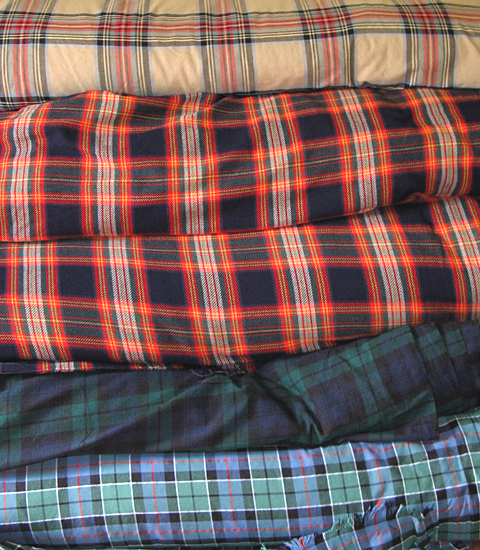 Originally tartan colors came from natural dyes found in local plants. 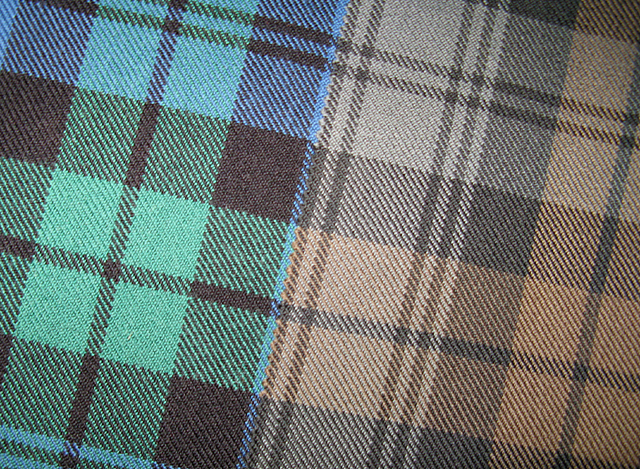 Because plants differ in their distribution around the countryside, you could tell where a clan was from by its tartan. These original colors are called the ancient colors, although they are currently made from modern aniline dyes. 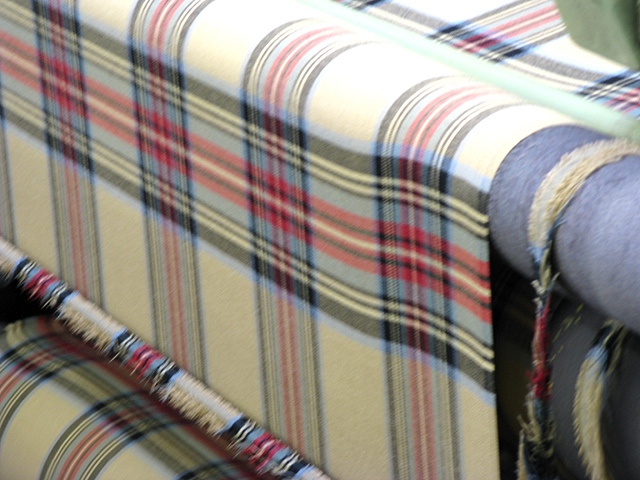 The same tartan pattern can be done in different colors and one of the alternative color combinations is called weathered. These colors tend to be darker and more muted compared to the ancient colors. (See Picture 10) for a sample of the ancient Sutherland tartan on the left and the same tartan pattern in weathered colors on the right. The final step in the process is quality control. In a room just off the main production floor are several light tables. The fabric is run over the tables looking for flaws in the fabric, that is breaks in the thread. If minor flaws are found, they are repaired by darning on the spot. 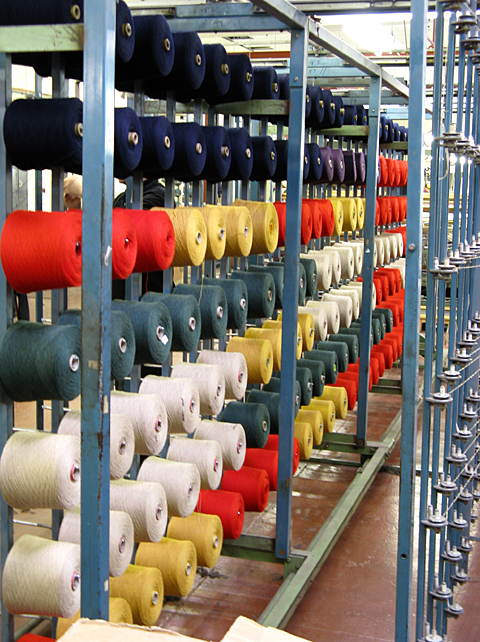 However, if major flaws are found, the fabric is returned to the production floor for correction. 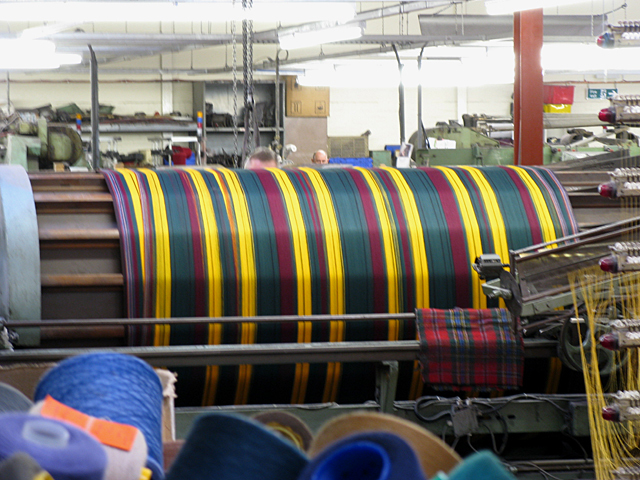 It’s not surprising that a sample of the fabric is put in for quality control after a loom is set up and before a big run begins. That way, any errors in setting up the loom can be corrected before a large batch is woven.